Welcome to our third year. Our little school has come so far since our founding in 2014, and I am looking forward to building further upon the strong foundation we have laid together. Tonight I’d like to talk with you about the Riggs program, which is the centerpiece of instruction in the Grammar School. Learning to read is the most important thing our students do in their early years, and our method of teaching reading requires a little explanation. 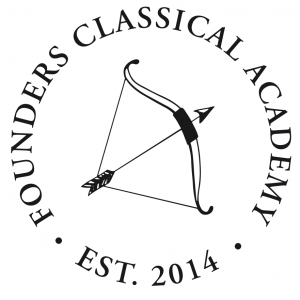 At Founders Classical Academy, we teach students to read using phonograms or part of words rather than sight words–whole words which are memorized. This phonogram based method is superior to the sight word method because it teaches students the principles of English spelling and pronunciation rather than asking them to memorize cold hundreds, and then thousands, and then millions of English words. As you can imagine, it is not possible to memorize the correct spelling of all of the words in the English language–there are just too many. Students who go through the Riggs program beginning in Kindergarten and going all the way through grammar school learn confidence with spelling, pronunciation, and handwriting, and they become lovers of the English language because they have learned not just how to use words correctly, but to delight in all of the different variations that are possible when you have the building blocks of the English language at your disposal. The Riggs program also teaches students precision and a love of order and beauty. Riggs is not just about learning to spell–it’s a whole language of instruction that begins on the very first day of Kindergarten and remains applicable all the way up through high school. Last week in Ms. Deviney’s class students practiced stacking their blocks, sitting in writing position, and holding their pencils correctly. Why do we spend so much time on these little things? Why don’t we hand out books and get started reading right away? The daily practice of coming to school dressed in your uniform, sitting down at your desk, and approaching your schoolwork with care and attention will over time turn into the habit of doing these things naturally. Order in your daily habits leads to order in your thinking. A student who has the right tools–the right habits–can learn without obstacles like an uncomfortable pencil grip, a confusion about pronouncing a difficult phonogram, or a habit of sitting that strains his neck getting in the way. Once the obstacles are removed that student can read a book not with the aim of pronouncing the words correctly, but understanding the meaning of those words. And that is the most important thing a student will learn in the Grammar School. As a school, it is our job to teach students handwriting, phonograms, and spelling, or, as we call it here, orthography. We take this task on to our own shoulders, and we assume the responsibility for seeing that it gets done well. Parents, what this means is that you don’t need to worry about the mechanics of spelling and handwriting at home. This is our job, and we promise that we are going to do it well. So what is your job? You all have heard me say that the partnership between parents and teachers is essential, and that your child needs to see that you support the teacher in order to thrive here at school. Tonight I want to talk to you about what that support looks like in a concrete way, and I hope, provide some relief to you parents who are concerned about the amount of homework you’re going to be dealing with this year. Before I say this, I want to explain a general principle. School is for learning the nuts and bolts, the mechanics, the method. Home is for practicing what has already been learned, not learning for the first time. But, in order for students to learn the nuts and bolts of reading, writing, and arithmetic, there needs to be a culture at home that celebrates learning and talks about school and learning in a way that encourages the child to delight in learning. I see too many students who think of school as box checking. Think about the conversations you have with your children in the car on the way home, or over dinner. Does this sound familiar? As the list goes on your anxiety mounts, and before too long you are wondering to yourself how you are going to get all of those pages read, all of those math problems done, while preparing dinner, making sure the lunches are ready for tomorrow, and getting everyone to bed on time. It is so difficult to remember that there is beauty in the things your child is learning, and to slow down and focus on that beauty rather than treating school like a never-ending to do list. What if the conversation on the way home were about the content, not the boxes that need to be checked? Suddenly the prospect of memorizing 2 lines and reading 6 pages doesn’t seem so daunting because what’s contained in those lines and those pages is fascinating stuff. Parents, from our perspective, the main thing you can do to help your child is to cultivate their natural curiosity and involve them in conversations about the interesting things they’re learning. Read aloud to your child. Choose books that are interesting, and don’t worry too much about choosing books that are at your child’s reading level. Instead, choose books that have rich vocabulary and an exciting story. You want to teach your children to love literature. Read in funny voices and talk about the story over dinner. Create an environment in which reading is exciting and an adventure. Remember–the mechanics of sounding out the words and calculating reading levels happen at school. Your job is to handle the fun part. Beginning this year, we are not going to be sending home lists of spelling words. The reason is that if we do that, your child will begin to memorize his spelling words as sight words rather than thinking about the rules of English spelling that are at work. Have you ever wondered why our spelling lists are so long? It’s because students aren’t supposed to memorize the words in them–they’re supposed to think about the rules of spelling that are at work in all of those words. Explaining the spelling rules is something we will do here at school so that you can focus on other things at home. Your child’s teacher may send home some sentences to work on as homework. We could use your help reinforcing lessons about grammar and punctuation. In class your students will be learning parts of speech, periods, commas and semicolons. All of these are things that you can discuss at home without adding to the list. Every parent is invited to come and observe a class, and I hope you will take us up on the offer. There is no better way to understand classical education than to watch it in action, and the teachers would love your help during recess and lunch while you’re here. Just contact the front office to set up an observation, and come as often as you like! As we get to know each other better and as our families get to know classical education, I hope you will see that although our curriculum is rigorous, it is also delightful. Discovering truth about the world is an exciting and inherently satisfying way to live, and we hope that our school gives you and your child the opportunity to continue that discovery at home. Let’s make it a wonderful year. Arrows up!